Next Generation Managed Print Services aims to help companies in using their information more effectively, and not only helps them print for less but also helps them print less. In order to achieve this, Fuji Xerox provides continual improvements that extends beyond optimizing output devices based on Managed Print Services. 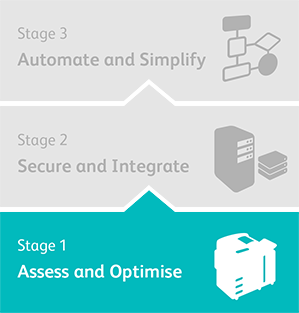 With Next Generation Managed Print Services, we have developed a three-stage approach that brings continuous value and provides services according to the maturity of the customer’s office. Measuring the maturity level of the office environment. The maturity level of the customer’s office environment is measured using Fuji Xerox technology and assessment know-how to provide services that suit the needs of the customer. In “Assess and Optimize” stage, we discover the total costs, usage status, power consumption and CO2 emissions of the customer’s output environment to create and manage optimal output environment. Adopt the latest assessment tools to perform an accurate analysis of the current output environment. Visualize total cost related to output environment and also visualize variation in cost, print usage and waste between departments and functions through the analysis of output environment, which will lead to the solution for improvement. Define a management policy and usage policy of output environment, and build and manage the ideal output environment for the customer. CompleteView® Pro turns a client’s print data into actionable knowledge to control and drive down costs, while reducing their environmental impact. IT is a web based application and is used to validate the Current State TCO with the client. Current State print data from Asset DB is exported to CompleteView® Pro which then provides the client with a comprehensive and accurate representation of the actual current costs and floor plan, including data on environmental impact. 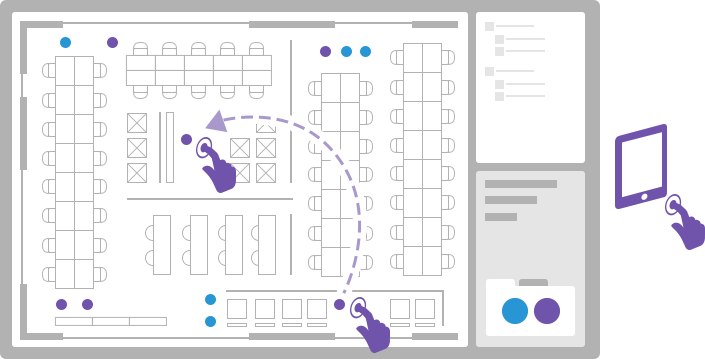 The CompleteView® Pro dashboards provide illustrative charts and graphs to help the user to visualize the costs, usage and design analysis of their print environment. This allows a direct comparison of the costs, performance and utilization of all the print devices whether they are in one office or across multiple sites. An industry leading MPS discovery and design toolset used to conduct assessments. Provides an intuitive floor-plan based drag & drop visual interface, unique depth and detail of data collection for superior insight, Total Cost of Ownership (TCO), Green reporting and Future State design. It allows the Current and Future States to be quickly analyzed and communicated through a simply understood graphical interface. With seamless integration between floor plans and the underlying database, it speeds up data discovery and improves the overall project duration and hence time to benefits. 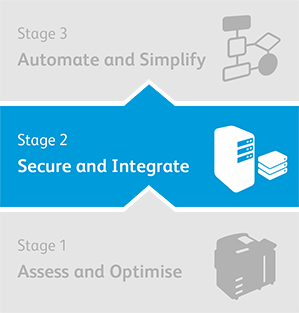 In “Secure and Integrate” stage, we enhance security and control output usage in output environment such as office print, centralized print, mobile devices and the cloud. For optimization of the customer’s output environment, connect output devices to existing IT environment safely in accordance with regulations. Adopt solutions for mobile printing and security enhancement. Define print rules for enhancing security, perform access management for output devices linking with IT/authentication systems and manage usage permission for users. 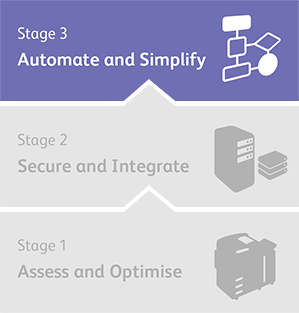 In “Automate and Simplify” stage, we analyze quantitative and qualitative data collected from the integrated management of the output environment. Based on analysis, we improve document related work processes, reform working styles and support the realization of the future office. Identify wasteful and redundant work processes using unique analysis methods, and implement paper digitization for workflow automation and more productive business process. Support new work style by providing environment where digital documents generated from various sources such as Web, desktops, tablets, smartphones, and output devices can be easily retrieved, saved, shared, and converted. Reduce time and cost for processing paper documents, improve accuracy and reproducibility of business processes, and enhance compliance and security throughout the document lifecycle. Improving your mailroom may help your business and your employee engagement. Managing your printing requirements means managing your printed content.